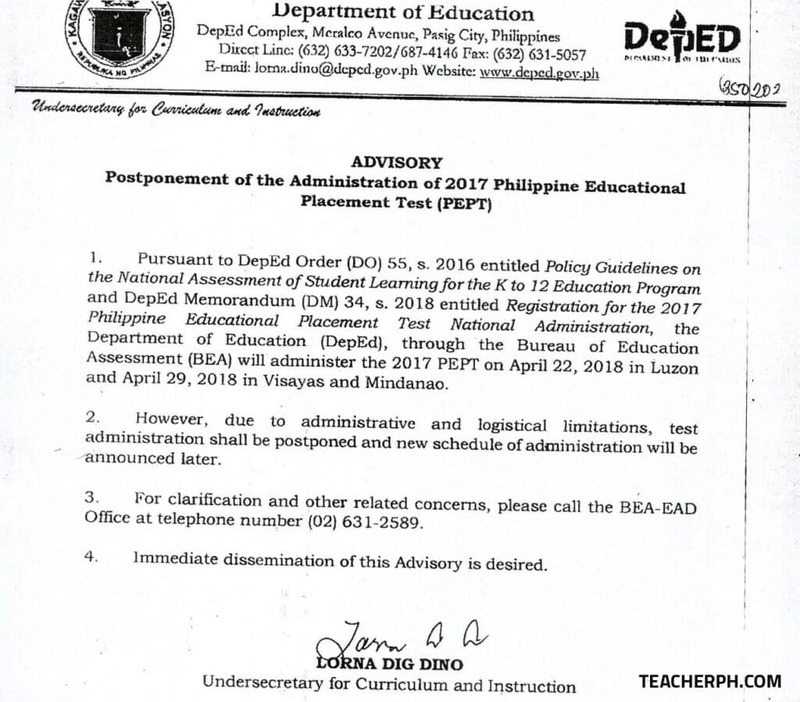 Pursuant to DepEd Order (DO) 55, s, 2016 entitled Policy Guidelines on the National Assessment of Student Learning for the K to 12 Education Program and DepEd Memorandum (DM) 34, s. 2018 entitled Registration for the 2017 Philippine Educational Placement Test National Administration, the Department of Education (DepEd), through the Bureau of Education Assessment (BEA) will administer the 2017 PEPT on April 22, 2018 in Luzon and April 29, 2018 in Visayas and Mindanao. However, due to administrative and logistical limitations, test administration shall be postponed and new schedule of administration will be announced later. For clarification and other related concerns, please call the BEA-EAD Office at telephone number (02) 631-2589.